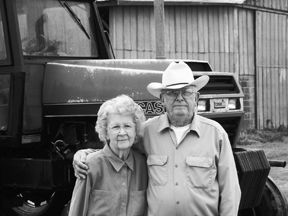 Nelson and Ruth Reinsch at their farm in Smyer, Texas. In 1999, at a protest at Georgetown University, a student grabbed the microphone and asked the crowd “Who made your t-shirt? 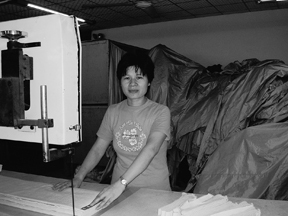 Was it a child in Vietnam, chained to a sewing machine without food or water? Or a young girl from India earning 18 cents per hour and allowed to visit the bathroom only twice daily?” Pietra Rivoli, a business professor at the university happened to witness this demonstration. At the time, she did not have the answers to the protestor’s questions, but over the course of the next several years, she found them. Rivoli decided to purchase a t-shirt from the $5.99 bin at a Walgreen’s drugstore in Ft. Lauderdale, and track its genealogy. What resulted was a book, The Travels of A T-Shirt in the Global Economy: An Economist Examines the Markets, Power and Politics of World Trade (John Wiley and Sons, 2005). Rivoli takes readers first to the cotton fields of west Texas where the fiber for her shirt was grown. She explains how the U.S. came to dominate in global cotton production. From slavery to sharecropping, technology to subsidies, U.S. farmers gained every advantage. Furthermore, every part of the cotton plant was turned into profit. The bolls, stems, leaves and dirt mixed with a molasses are sold as cattle feed to neighboring feedlots. Cottonseed will most likely be bought by Frito-Lay and end up in potato chips, or sold as aquatic feed to nearby fish farms. 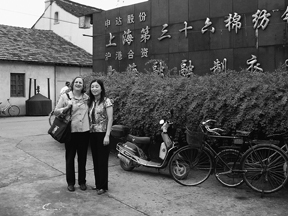 The next leg of Rivoli’s journey takes her to China where she visits textile factories and workers, many of whom are young women who have left the farms in hopes of economic independence. Rivoli explains how the textile industry has shifted from New England to the Carolinas, to Japan, to Korea and is now largely dominated by China. Trade agreements have set quotas to restrain China and protect textile production in the U.S. and other developing nations. Rivoli provides a fascinating insight into the power and politics negotiating these agreements, and how our foreign policy can often dictate who the U.S. opens its markets to. While Rivoli still owns her t-shirt, she also explores its possible fate if it were donated to charity, where it would be assessed for resale in the U.S. or more likely shipped and sold to traders in Africa where it would compete on the market against locally produced apparel. Rivoli hopes her t-shirt conveys that free markets are not always free, globalization is not a black and white issue, and the complexity of world trade deserves the attention of both its proponents and critics. Sangamithra Iyer had a chance to ask Pietra Rivoli about her t-shirt’s travels. What did you hope to learn from this journey? What do you hope people will get from reading this book? One of the things Karl Marx said about the effects of capitalism is that we lose track of where things come from—how they come to be. I think Karl Marx turned out to be mostly wrong about communism, but had some smart things to say about capitalism. As markets become more efficient and more global, we get further away from the things we consume every day to the point we don’t even think about where they come from. I guess one of the main things that affected me and I hope affects readers is the idea of stopping every once and awhile and looking at the cup of coffee in your hand, or the shirt you are wearing and thinking about where they come from. It’s an important part of being an educated person in today’s world. Your book starts off exploring how the U.S. cotton industry reached and has remained at the top. Subsidies are part of the equation, which amount to more than the GDP of some developing countries. How do you think cotton subsidies will be addressed in the 2007 Farm Bill? Cotton subsidies are gradually going to be chipped away. I don’t have a precise prediction about which programs can be cut by how much, but I’m fairly confident that over the next decade, they are going to be eroded and U.S. farmers are preparing for that. Moving on to textiles. Can you explain the significance of the Multi-Fiber Agreement, which put import quotas on textiles from various countries? Can you give an update on the phase-out of this agreement? The main impact of the Multi-Fiber Agreement has been to kind of spread the wealth. Rather than having textile and apparel production being concentrated in two or three of the most efficient producers, the Multi-Fiber Agreement spread out the market and gave small pieces to dozens of developing countries. So you had countries like Jamaica or Mauritius that probably would not have had a textile industry without the MFA. That was the main effect. Since the phase-out, it has been kind of interesting. We were only actually quota-free for about six or seven months of 2005 and the U.S. and European industries were successful in getting quotas put back on China. These quotas are supposed to be phased out again, in 2008 for the U.S., and 2007 for Europe. If that actually happens, we will really see the effect of a quota-free world. You mentioned that when the U.S. opened markets to Cambodia it was done with a contingency of having labor standards monitored by the International Labor Organization. Does “Made in Cambodia” guarantee sweatshop-free? Why isn’t all trade mandated with such a requirement? I think that consumers do have assurances because Cambodia has staked their comparative advantage on this claim, and so the companies operating there have put quite a lot of resources into their commitment that their supply chain be pretty clean. Your second question is pretty tricky. I think it can come close to infringing on country sovereignty. Countries are free to make and enforce their own laws. There’s a bit of an imperialistic smell for Americans or anyone else to say these should be your labor laws. There is also some resistance to the idea of “Big Brother” telling other countries what ought to be. I do think you will see more of these things in trade agreements especially with the Democrats in charge of Congress. China is also under a lot of pressure from the European and American companies that are producing there, because they just don’t want to deal with these sorts of problems. Things in China are getting better, but not as fast as everyone would like and not as transparently given that they do not have freedom of information. But slowly and bumpily they are responding. It is fascinating how the textile industry has played a role in U.S. foreign policy. You mention the U.S. guaranteeing markets to cooperating countries in the war on terror. But could this position be used to leverage human rights around the world? Generally the way policy works is the State Department focuses on human rights and tends to be quite liberal in trade. The Department of Labor is more concerned with labor issues. So the machinations of how policy gets set in Washington are pretty complicated. What you would need is somebody with a big stake in human rights who also had leverage on trade. Given that power is distributed in such funny ways in Washington it is hard to find places where they have both the will and the way to speak on both of these issues. It’s much more common, as you know, for them to be responsive to the lobbyists and the business interests. So it is theoretically possible, but practically not as likely. 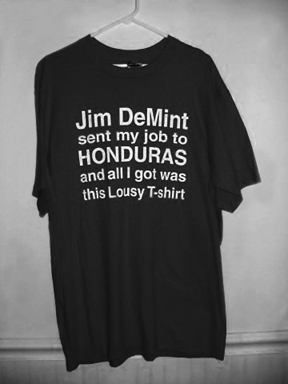 In your book you claim the trade in our discarded castoffs to Africa is the only leg of the journey where your t-shirt experienced free trade. Interestingly, you started that section by talking about how women in Tanzania were so striking with their fabrics, yet you ended up talking about the benefits of trade in American discards. What does it mean when people are wearing our discarded “Race for the Cure” t-shirts and can’t afford locally produced textiles? Karen Hansen, an anthropologist at Northwestern University did a much more exhaustive study of this. I’m not an anthropologist, I study the economic and business side, but her observation from field research was that our discarded clothing was used to contribute to the Africans’ way of dress. Rather than trying to look like us, you see these women who have combined traditional dress with Western dress in very creative ways. It is also interesting that the traditional cloth that many of the women wear is coming from China anyway. Some of the criticism against this trade is that it suppresses local textile industries. You suggest it might suppress the domestic market, but not in terms of exports. I think it is still largely about serving another empire both by producing cheap clothing for export and having to rely on castoff imports. It is the developed countries that largely benefit. There might be some marginal improvements in the lives of people, but that disparity between the rich and the poor still remains. Absolutely. Africa is the one region of the world where the disparity is not narrowing. It is the biggest development challenge that we all face. If you look at all of the regions in South Asia and East Asia, the income disparities have been narrowing since the 1970s and Africa is the one place where that is not true. So you’ll get no criticism from me. The race to the bottom you talk about seems to be based on the notion that some people are worth less than others—others with limited opportunities are exploited for cheap goods we readily discard. While the young woman in the sweatshop factory prefers this to a life on the farm, she might still be kept in a place where her upward mobility is capped. If you look at what’s happened with economic development within the U.S., you probably wouldn’t conclude people who worked in factories were capped in terms of their upward mobility, so why would we say that is true in China? There is no doubt the biggest barrier to improving the status of life in China is the totalitarian government in charge and the fact that people don’t have the freedom to essentially write their own destiny. If you can’t vote, read or write what you want, then that is a bigger impediment to your progress as a human being than having a job in a factory. Every time I go back to China, people are doing better, materially. The women who have worked in textiles have moved on, either because the textile factories have closed or they got a better job in the auto factory, but they still can’t vote, read or say what they want. If I were concerned of the prospects of the women in China, I would be much more concerned about that than I would about the fact that they are working in a factory. What is happening in China now is that the factory workers are holding a lot of power, because there are extreme labor shortages. 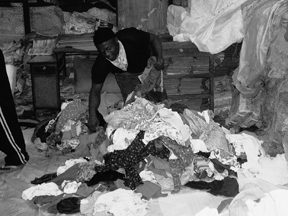 The factories producing textiles cannot find the workers they need to keep producing. The power has shifted. Rather than having millions of people begging for a job and being exploited, you have instead thousands of factories begging for workers. I think that is a sign of progress. China has come a long way. I think it’s quite dangerous to make judgments about workers in China, without talking to workers in China because they have much different things to say than those of us who haven’t been in their position. As an educator, I hope people on both sides suppress their knee jerk reactions and appreciate some of these complexities. I appreciated your effort to tell different sides of the cotton story. You tell it from an economic perspective, but part of that story that I felt was missing was looking at the environmental legacy of cotton. Our highly consumer driven and disposable society’s demand for cotton might be valued as something positive in an economic light, but not so much from an environmental perspective. If I do another edition of this book, the whole environmental story is something I’d address. Part of that is because I’ve been thinking about it a lot more, but I’ve also noticed, when I speak about the book this is something that people are really interested in. In terms of the conflict between the environment and economics, our goal has to be to make sure environmental costs are accounted for when we talk about economic benefits. It is one thing to say this trade is economically beneficial, but if we haven’t accounted for the environmental cost, then we haven’t done a complete analysis. We are getting better at being able to quantify and analyze some of these costs, but in a lot of business and economic analyses, it is just not a piece of the equation the way it needs to be. Has your university changed its apparel policies? Well, they’ve changed quite a bit. Not just my university but also a number of universities in the U.S. had pretty dramatic shifts in their policies over the past seven years. We’ve basically gone from knowing nothing about where our logo apparel came from to knowing almost everything. We only do business with companies that will disclose their factory locations. We require all of our companies to have codes of conduct and monitoring systems largely designed to address labor issues. And there are organizations that serve the university community like The Fair Labor Association and The Workers Rights Consortium that did not exist 10 years ago. Both of these are especially important because they really do the legwork of monitoring factory conditions for us. There has been an enormous change. Where will you buy your next t-shirt? [Laughs.] I’m not going to buy any t-shirts for a very long time. I’m a bit of an anti-consumer myself. I have enough t-shirts. I have enough everything, so I’m not actually buying more anything. But I do now pay attention to where my things come from. If I were looking for something, which I’m not, I’d be much more comfortable buying from supply chains that I am kind of familiar with than something from an unknown place.